Oh Lord...I LOVED fashion plates. I was a spoiled kid, my grandma made sure of it! Maybe you should check E-bay from time to time to see if someone found a set and is willing to part with it. Man I must have lived under a rock or something. never heard of these either! 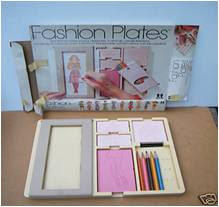 I don't think I ever heard about Fashion Plates, but I totally would have wanted to have it! I always wanted one of those science sets that came with instructions to make different experiments! I had these and I loved 'em! I seriously would play for hours with them! MY SISTER HAD THAT TOY. Truth be told I was kinda jealous. Looked kinda cool. I even remember that corny, jazzy TV jingle, "...and they call it fashion plates.."
I might have to purchase that new version for my niece this Passover. I swear I'll give it to her and not keep it. Promise. Aw! I loved my Fashion Plates. Thanks for the trip down memory lane. I love love love Fashion Plates. i remember wanting a motorized barbie jeep... i was like 7 and i wanted a freakin power wheels... is that weird? actually i think i was like 12 and wanting it, but 7 sounded a little more realistic even though i think you're really like 3 when you get those.... but instead of the power wheels, i got this doll that was like lifesize and there's this homevideo of me BEYOND thrilled when i opened this box!!! i say over and over again (in the most shrieky little girl's voice ever) "it's her mommy, it's her!!!" mind you i wore big glasses and had dumbo style ears with a tight headband holding all the hairs back, so you could really see the dumbo style ear effect.... and i would cover my face and just shriek again "mommy it's really her!!!" Oh dear god. I loved fashion plates! My sister bought my cousin's kid something similar made by Project Runway for christmas last year. So maybe you can still get them, Ally! My sister had those fashion plates! I would want to play with them and she would never let me. And she would hide them on me when she went to school! 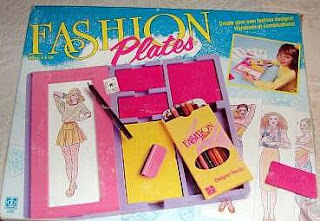 I loved those fashion plates. I remember those. My friends had those. I actually spent one rainy afternoon playing with them. They also had a version that was for boys were you mixed and matched monsters. I did my best to combine the two. I'm going to buy that sticker maker.... My son will love that! He's a sticker fiend! I remember these! I actually had these! Sadly, I ruined most of my toys. They need to bring fashion plates back. Especially since our culture is so america's next top model/project runway obsessed. I could see them being sold at urban outfitters. i had an earlier version than what you linked to...mine all had Cheryl Ladd hair, knee length booths, or cork wedge heels to choose from! And one of my students has the current Project Runway version of them, and i was trying to tell her about F.P., and how cool they were even tho they were low tech as hell and she prolly wouldnt even like them now....i dunno. Again.. you're channeling me! I had a play-set JUST like this except it made vans. (The vehicles not the shoes) LOL! Guess I need to do a review now huh? Heck.. I can even create a few vans because yes.. I still have the play-set!!! I too must have been shoved under that rock with Ian because I don't recall these things either. Aw. I never had those either. I can't help feeling as if I should blame my parents for my homeless man fashion sense, because they did not buy this for me. I think I remember them though! I had a fashion plate and LOVED it! I bought a barbie one for Emily 3 years ago and she loved it too. I had fashion plates. I loved them. I totally remember those things. I didn't have them but my sister did. I don't remember if I used them or not. I love nostalgia! I loved fashion plates. I looked them up on ebay recently to get some for my niece and they were a bit pricy and I am cheap so was always outbid. Thanks so much for following the claw! made my day b/c I lost a follower this morning! omg!!!! i LOVED these! i never had them but one of my cousins did and they were great!!!!! I never had them either but now I'm wishing that I had. My brother had the van ones just like Darrin -wish that we still had them too. They were pretty cool. we just payed with fashion plates today. i love this toy so much that i bought it on ebay six years ago before i even had children. lOVE it. and love your blog. My sister and I each had a set of these, played with them a ton even though the total possible outfits was pretty small. We just made them over and over. They might even still be stored in our barn somewhere with all the other stuff that never made it to a tag sale. I should find stuff and put it on eBay (I was already semi-OCD as a kid, probably still have all the parts).